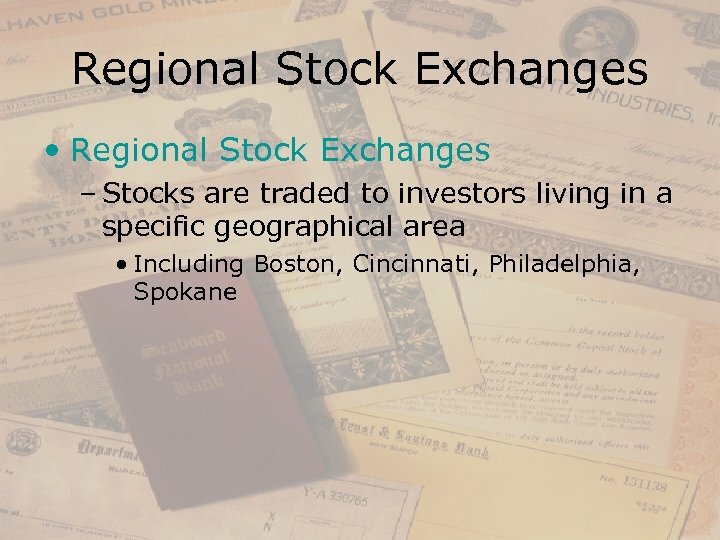 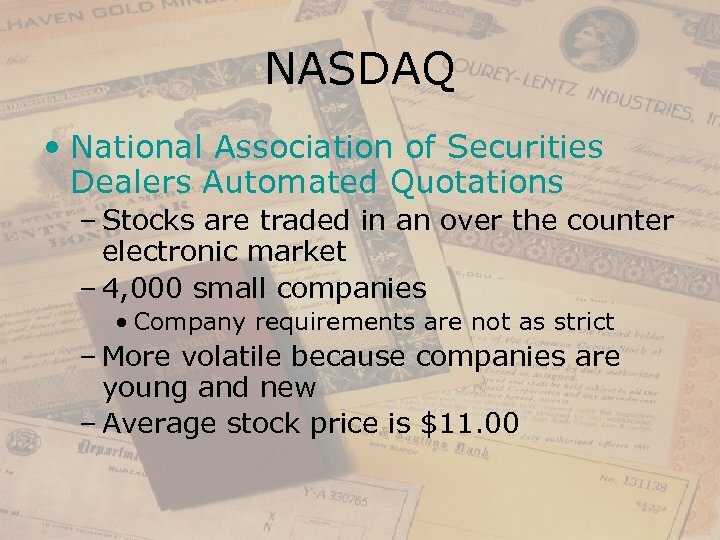 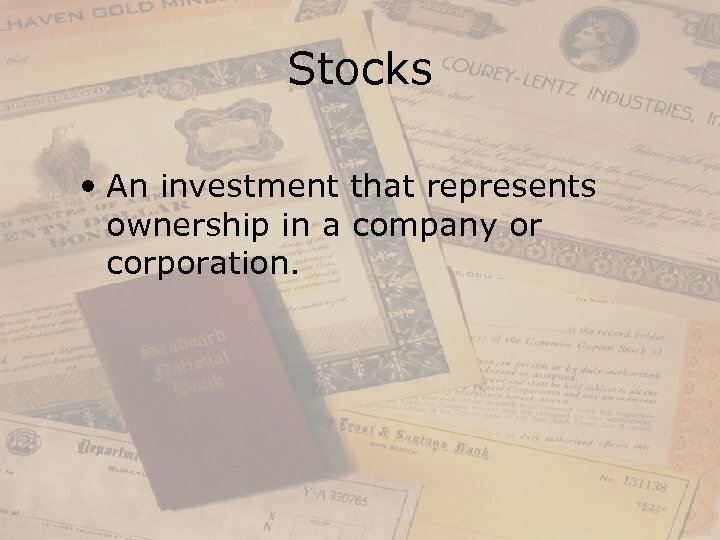 Stocks • An investment that represents ownership in a company or corporation. 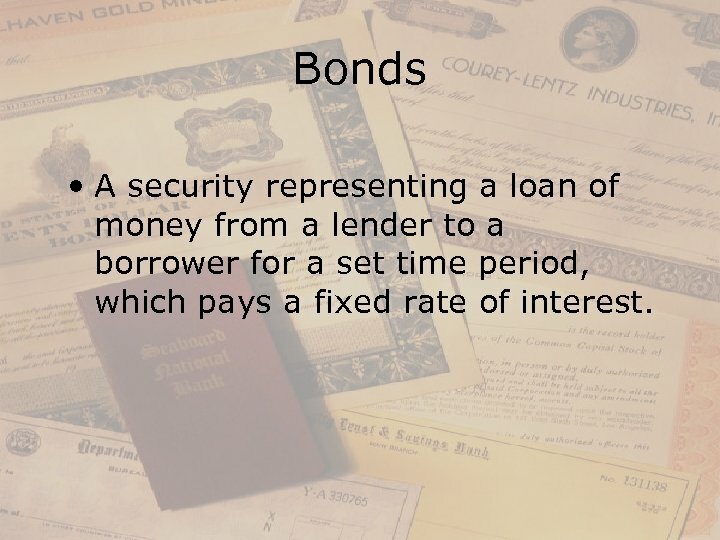 Bonds • A security representing a loan of money from a lender to a borrower for a set time period, which pays a fixed rate of interest. 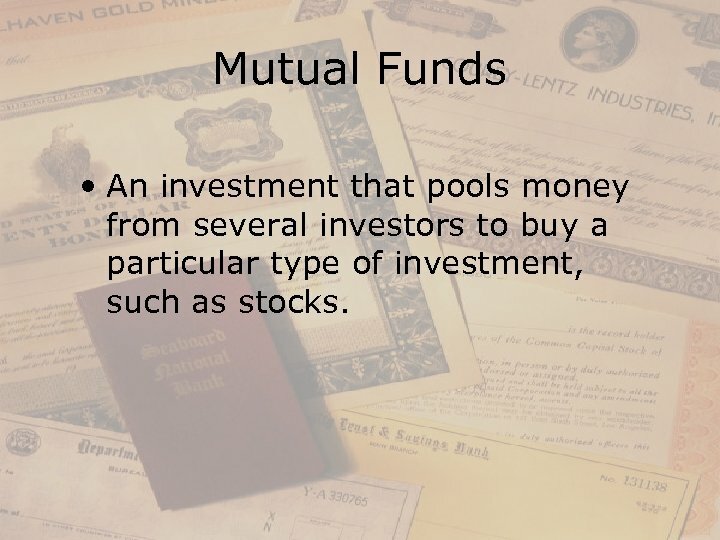 Mutual Funds • An investment that pools money from several investors to buy a particular type of investment, such as stocks. 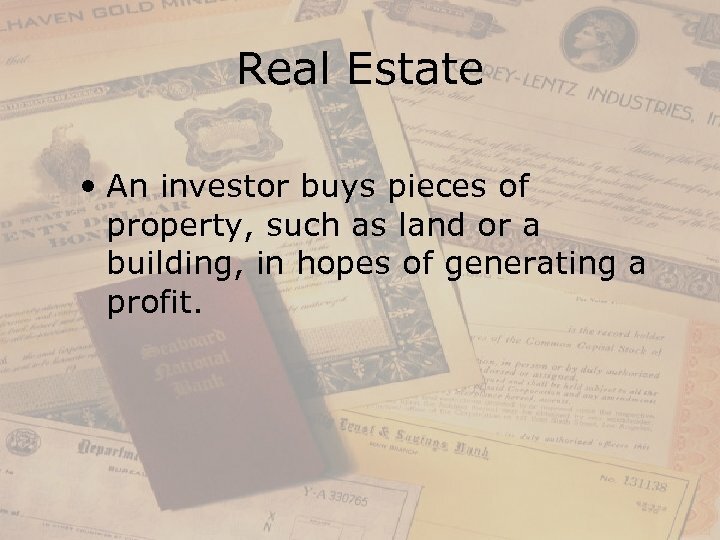 Real Estate • An investor buys pieces of property, such as land or a building, in hopes of generating a profit. 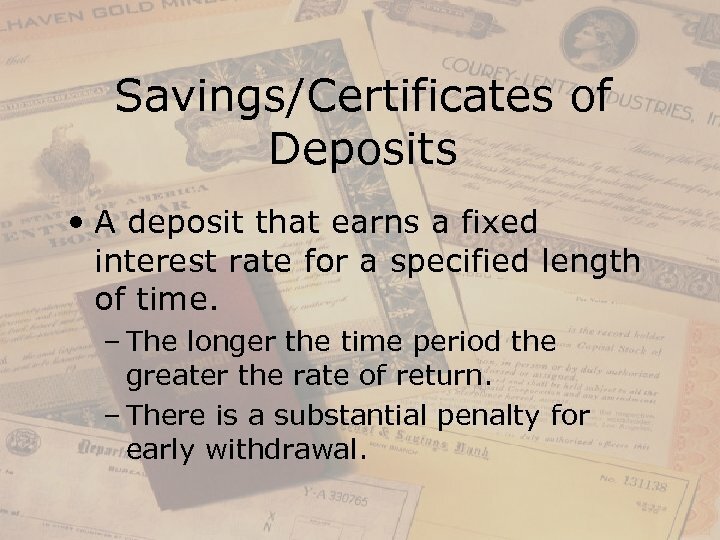 Savings/Certificates of Deposits • A deposit that earns a fixed interest rate for a specified length of time. 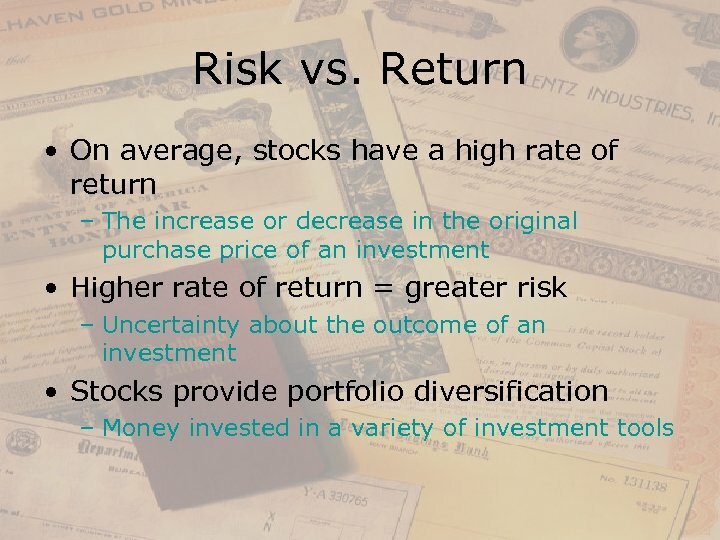 – The longer the time period the greater the rate of return. 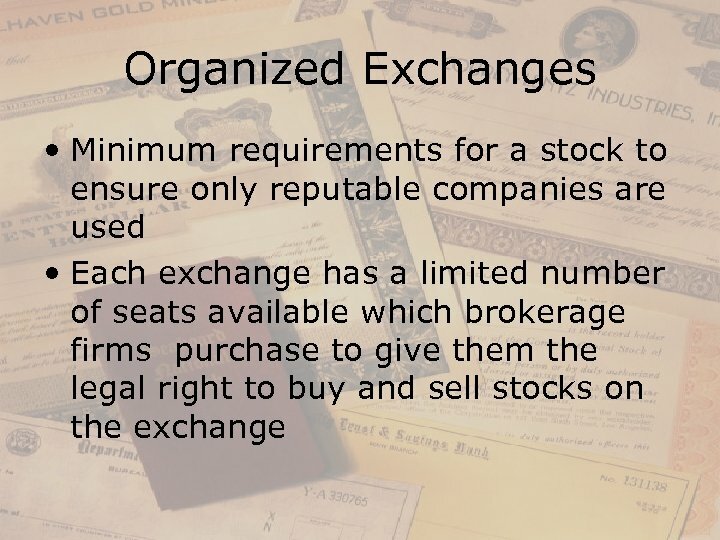 – There is a substantial penalty for early withdrawal. 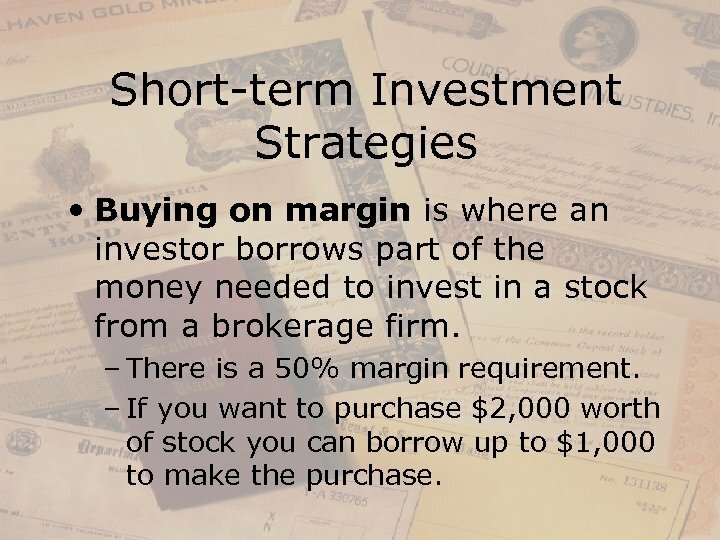 Short-term Investment Strategies • Buying on margin is where an investor borrows part of the money needed to invest in a stock from a brokerage firm. 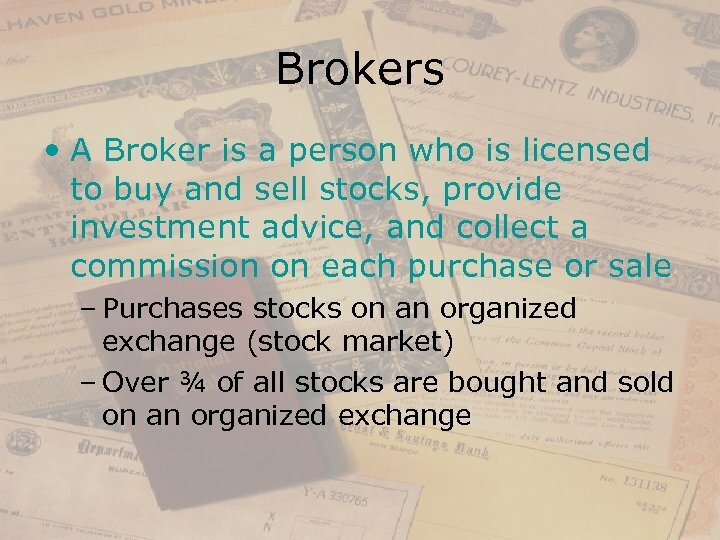 – There is a 50% margin requirement. 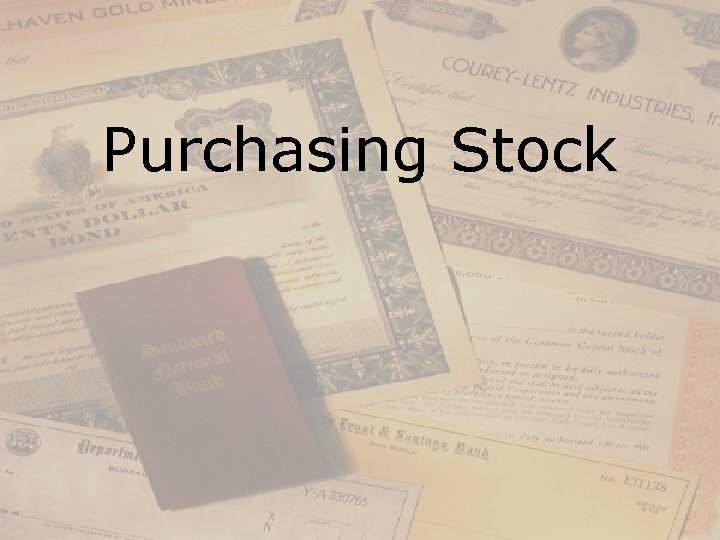 – If you want to purchase $2, 000 worth of stock you can borrow up to $1, 000 to make the purchase. 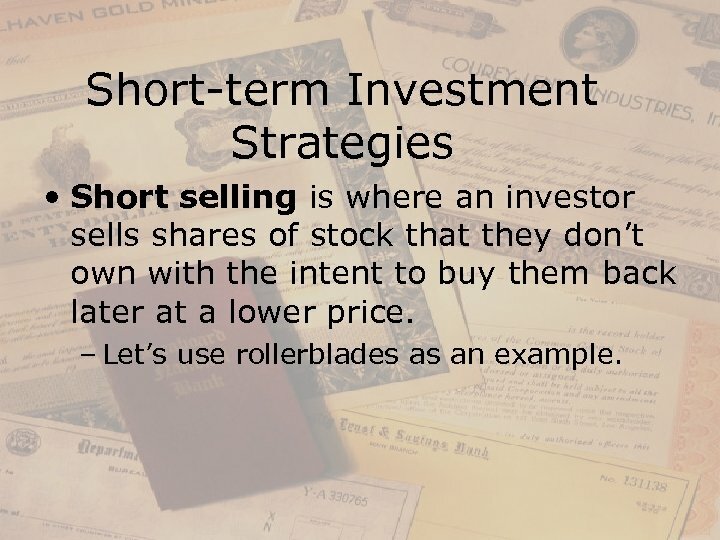 Short-term Investment Strategies • Short selling is where an investor sells shares of stock that they don’t own with the intent to buy them back later at a lower price. 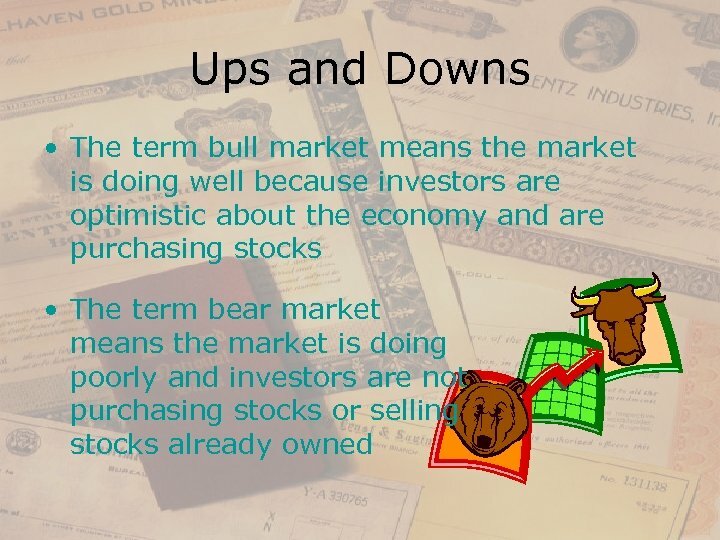 – Let’s use rollerblades as an example. 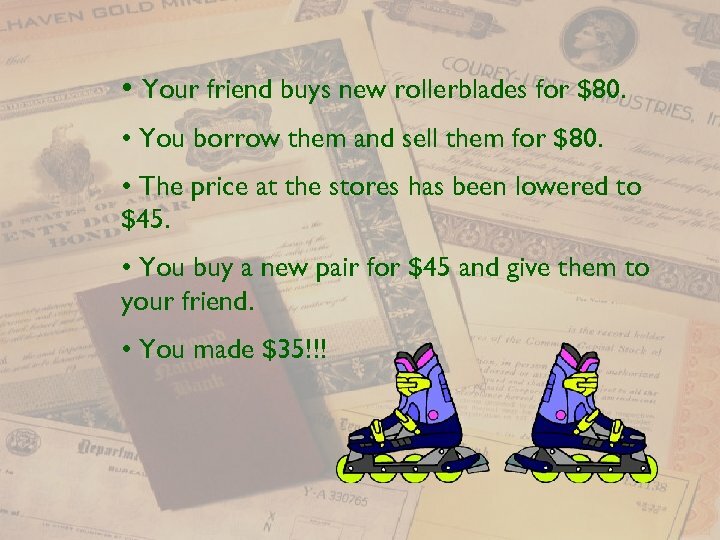 • Your friend buys new rollerblades for $80. 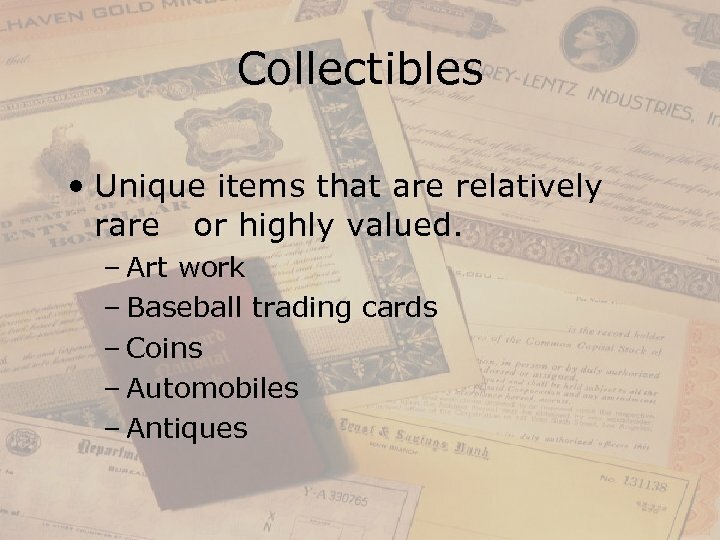 • You borrow them and sell them for $80. 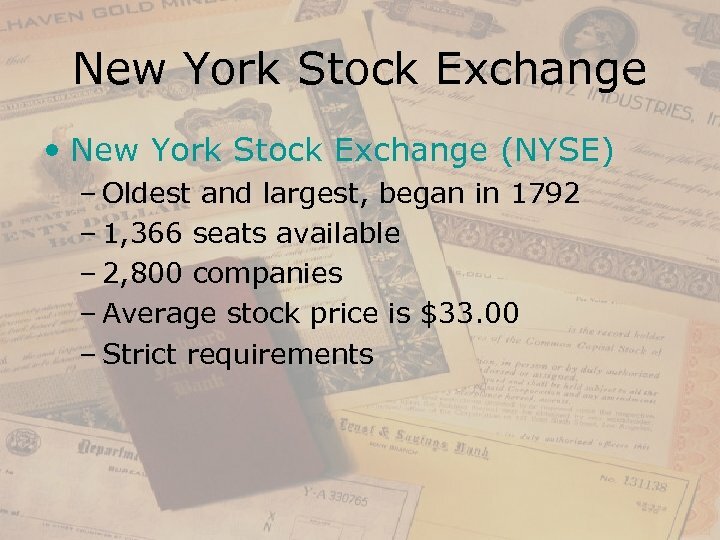 • The price at the stores has been lowered to $45. 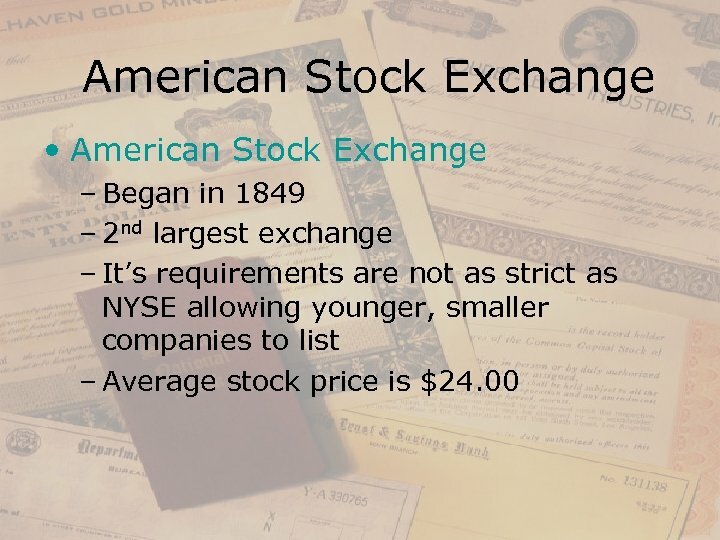 • You buy a new pair for $45 and give them to your friend. 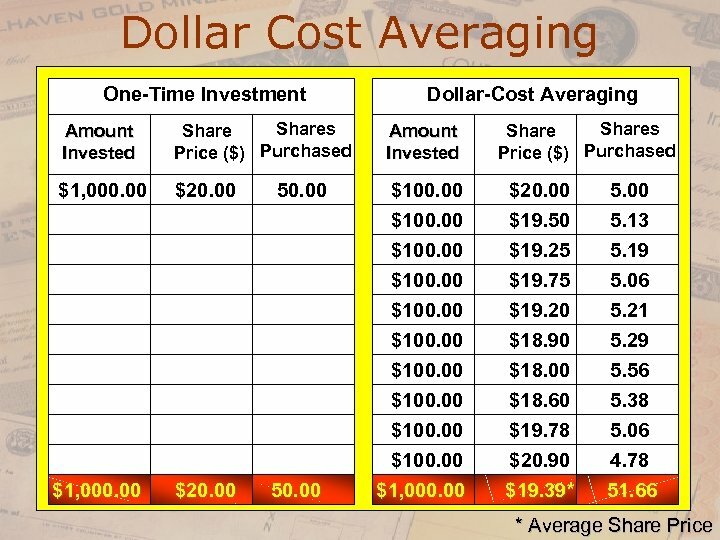 • You made $35!!! 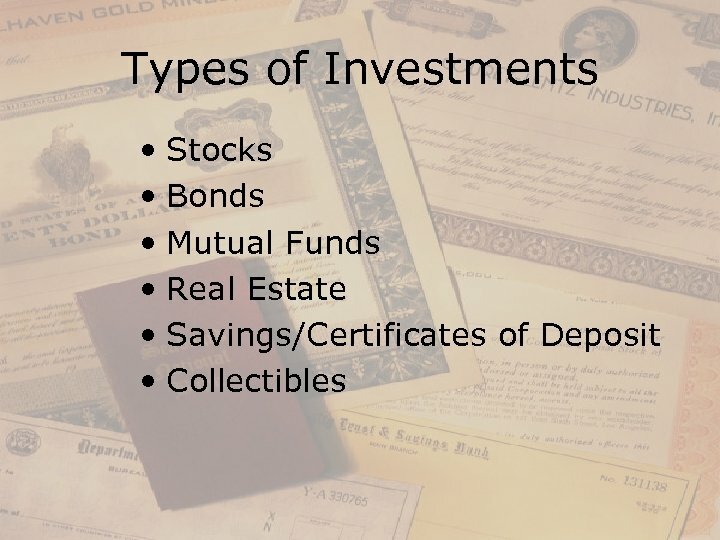 Long-term Investment Strategies • Diversification is spreading your assets among different types of investments to reduce risk. 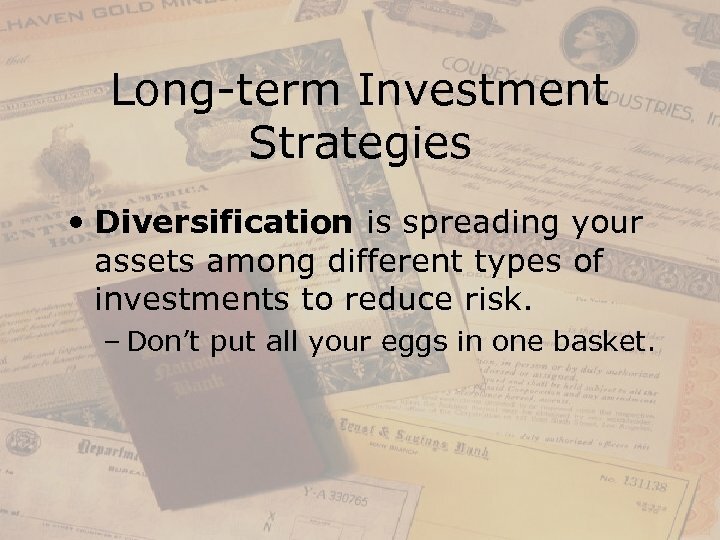 – Don’t put all your eggs in one basket. 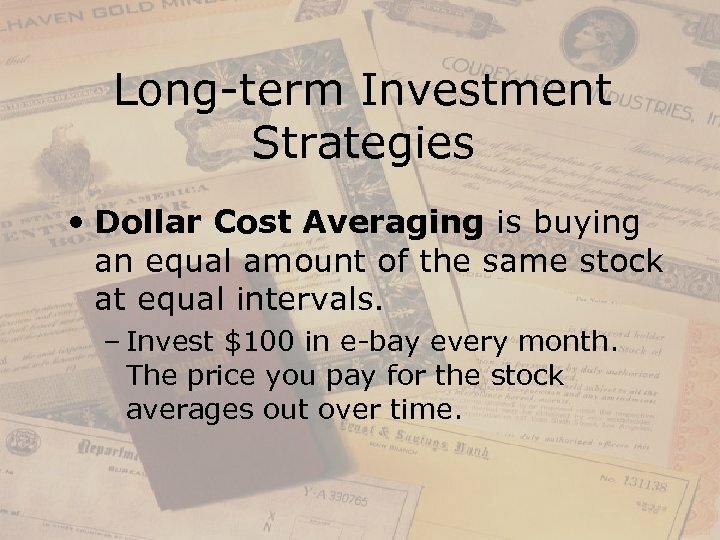 Long-term Investment Strategies • Dollar Cost Averaging is buying an equal amount of the same stock at equal intervals. 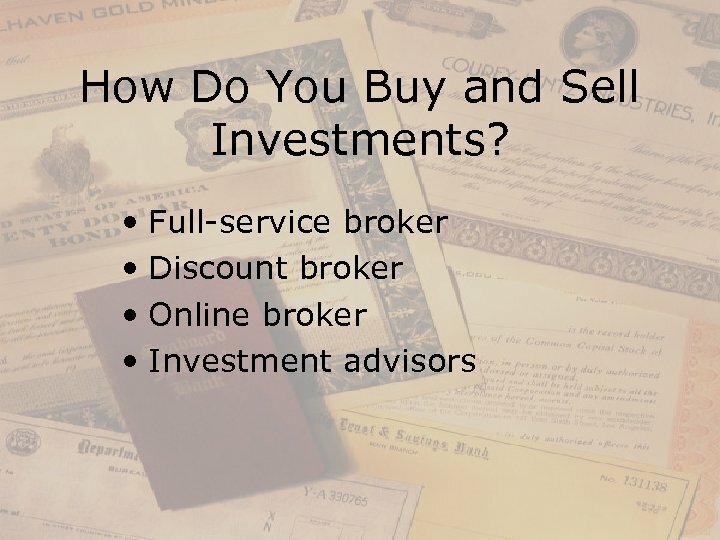 – Invest $100 in e-bay every month. 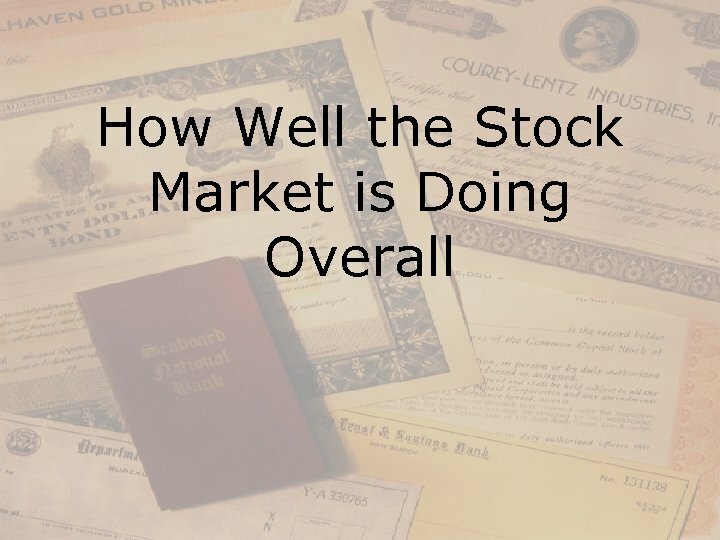 The price you pay for the stock averages out over time. 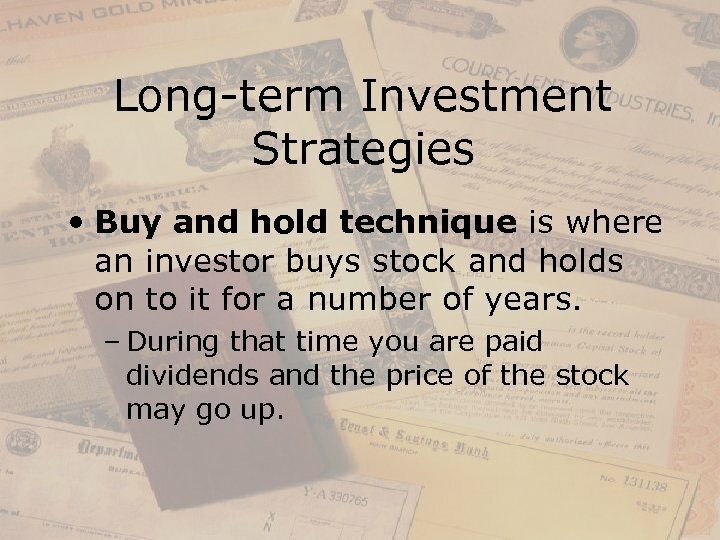 Long-term Investment Strategies • Buy and hold technique is where an investor buys stock and holds on to it for a number of years. 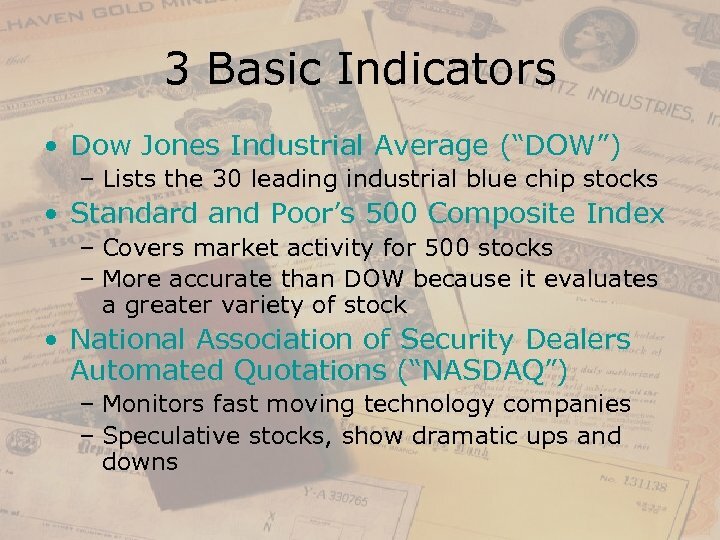 – During that time you are paid dividends and the price of the stock may go up. 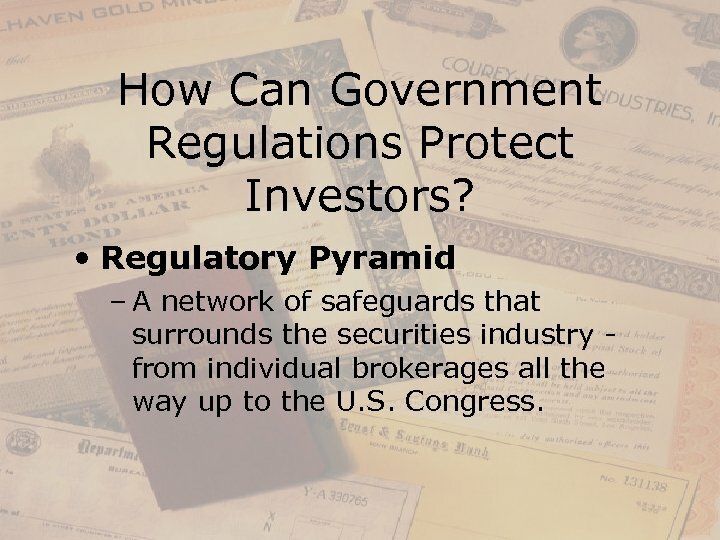 How Can Government Regulations Protect Investors? 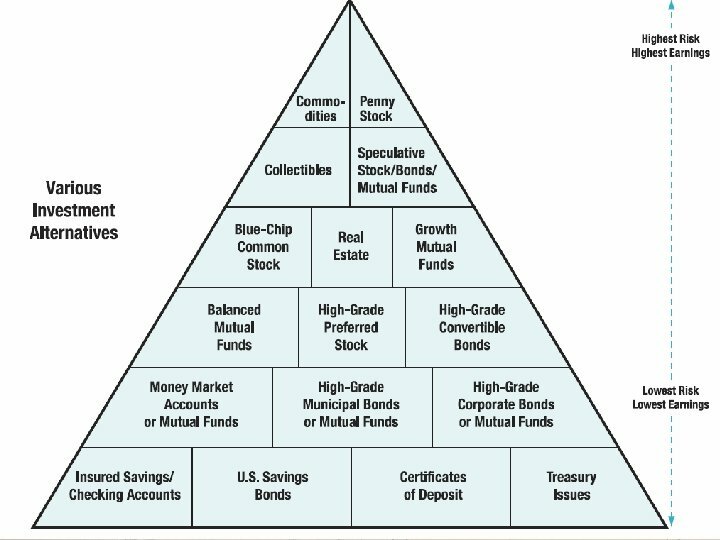 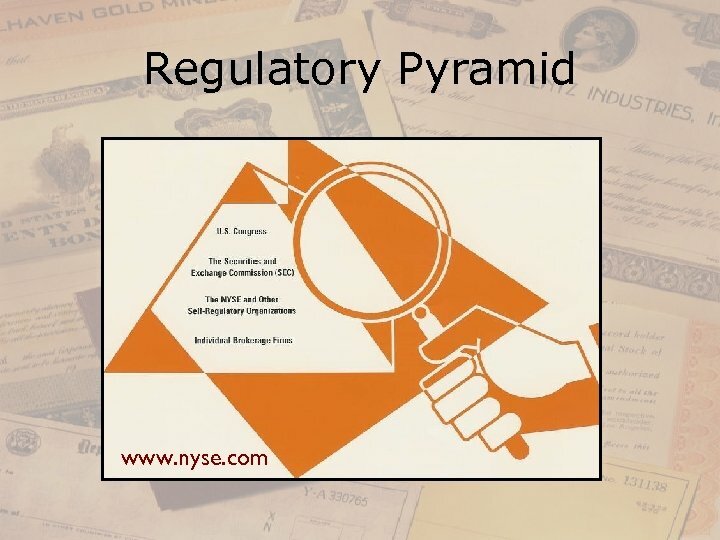 • Regulatory Pyramid – A network of safeguards that surrounds the securities industry from individual brokerages all the way up to the U. S. Congress. 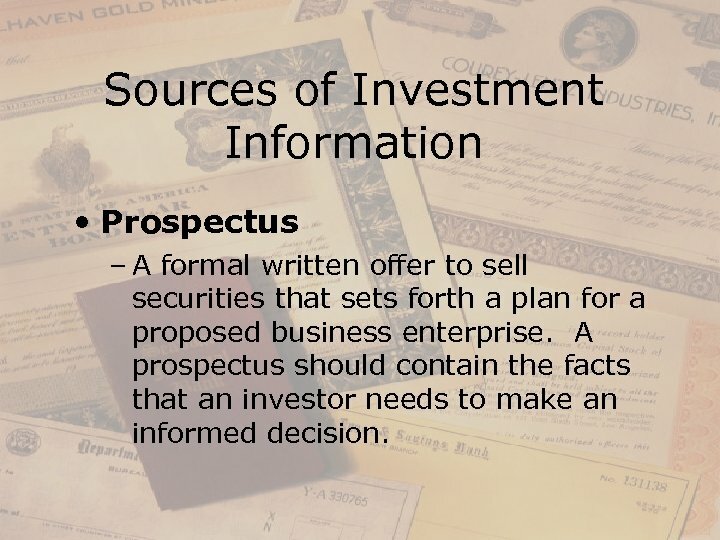 Sources of Investment Information • Prospectus – A formal written offer to sell securities that sets forth a plan for a proposed business enterprise. 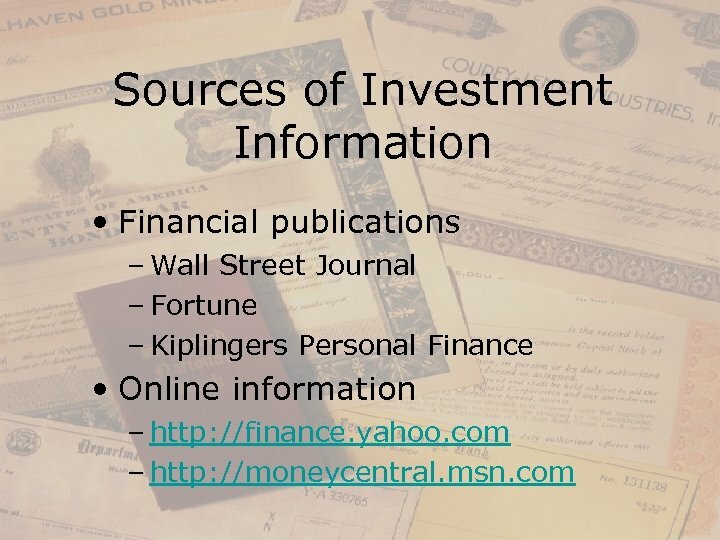 A prospectus should contain the facts that an investor needs to make an informed decision. 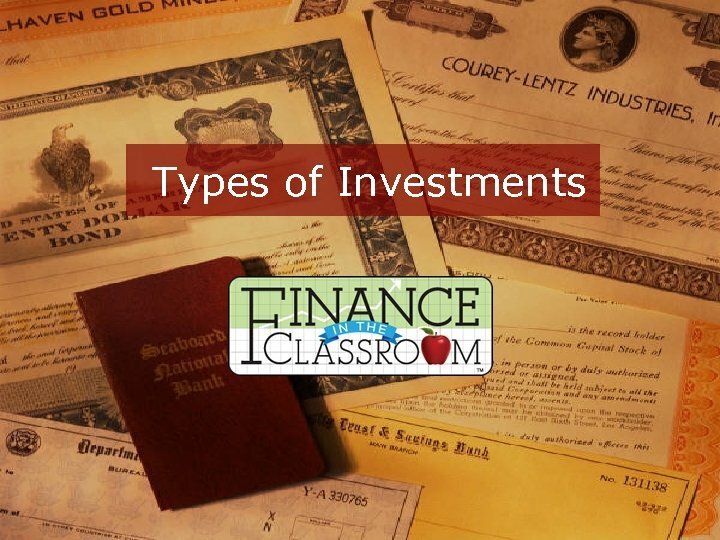 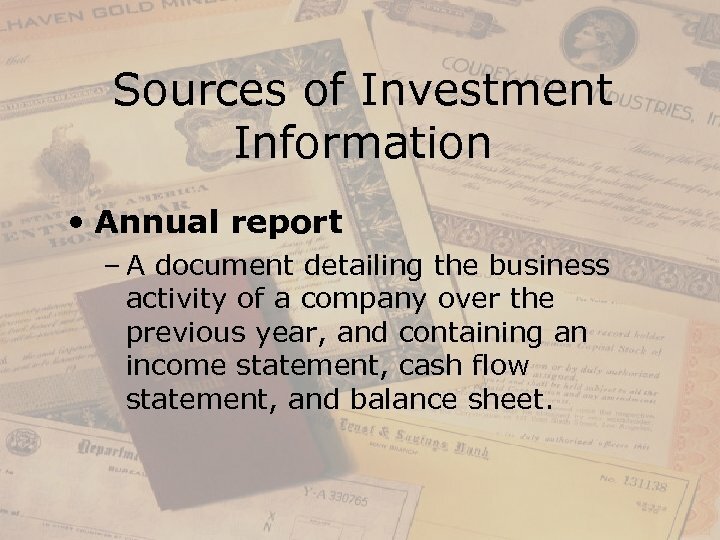 Sources of Investment Information • Annual report – A document detailing the business activity of a company over the previous year, and containing an income statement, cash flow statement, and balance sheet.